High pressure is good, right? Sunny skies, light winds, and dry conditions? A nice break from stormy, wet conditions? Not necessarily true here over the western lowlands during cool season. For us, high pressure often brings something I personally dislike more than storms---endless low clouds. And often air pollution as well. It is Saturday morning and here is the latest visible satellite picture. Low clouds over the Willamette Valley and western Washington lowlands. There are clear skies over the mountains, along much of the coast, and yes over those fortunate folks in Sequim and Victoria. Some higher clouds are found over eastern Washington from a weak system moving southward out of Canada. As shown by this morning's surface pressure chart. high pressure dominates our region, with the center of the high pressure offshore. No storms, no rain, no snow. The pressure gradients over us are weak and the winds are light. It appears that we are going to be stuck in this pattern for the next week. Lucky us. The problem is that in the Northwest, high pressure around during the winter is a low cloud production machine. First, with a high over us or nearby the winds are light, since the large pressure changes (gradients) are at the periphery of highs. Less winds means less turbulent mixing of air in the vertical. Highs generally bring sinking air in the troposphere and thus lack of middle and higher layer clouds. Lack of clouds means the earth can effectively radiate infrared radiation to space and thus cool the surface. The cooling surface cools the very lowest portions of the atmosphere. Air can cool to saturation and give you fog and low clouds. 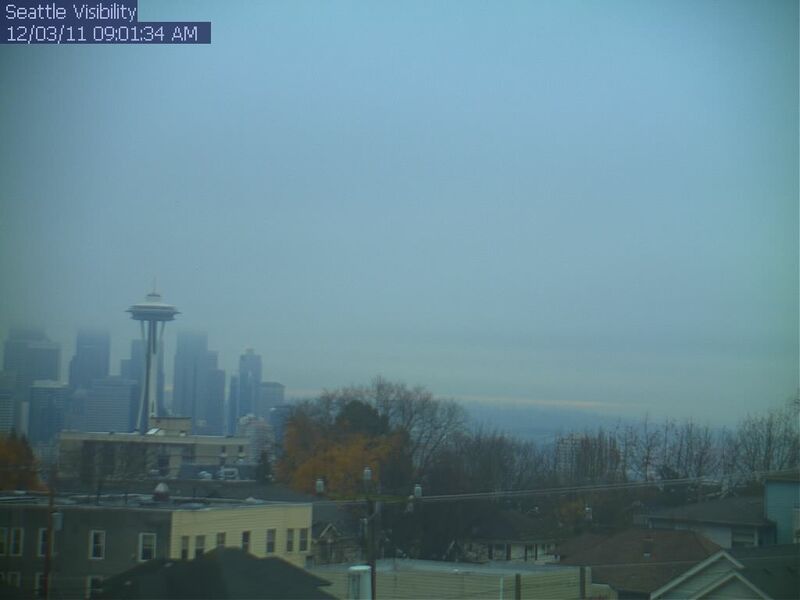 Saturday morning in Seattle. Mt. Rainier is straight ahead. See it? And did I mention that the very long nights this time of the year gives the surface a lot of time to cool and the weak sun hardly produces enough warming to heat the surface and mix this out? The same weather pattern in the summer would be no problem...we would have sun after perhaps some morning clouds. And it gets worse. Since we have had rain for a while the surface is moist, with lots of water to give to the atmosphere, and with high pressure offshore, moisture streams in at low levels off the ocean. And once in place fog and low clouds cool at the top (infrared cooling to space) and tend to reinforce themselves. Diabolical. Now today and tomorrow, the inversion will be weak and shallow enough for there to be a good chance it will mix out a bit this afternoon and give us some sun. Good time to rake leaves or take a walk. But as we get into next week, we will probably experience days in which we stay in the murk all day. The good news is that you can get out of this by going up...head to the mountains or even a high park--such as Cougar Mountain regional park. Or take a walk up Tiger Mountain (top 2500ft). The worst place to be is the southern Sound lowlands. Finally, a major issue with such situations is air quality. Inversions and light winds bring deteriorating conditions and in fact the Puget Sound Clean Air Agency has a burn ban going on right now. Just to prove to you that air quality is declining, here are some plots from two local reporting stations. 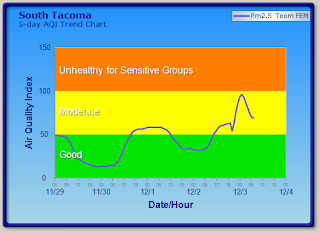 We are now seeing moderate AQ conditions and it won't be long before we are in unhealthy ones. Anyway, it helps to know what is going on and that escape is always possible with a short drive. It gives one a sense of control.